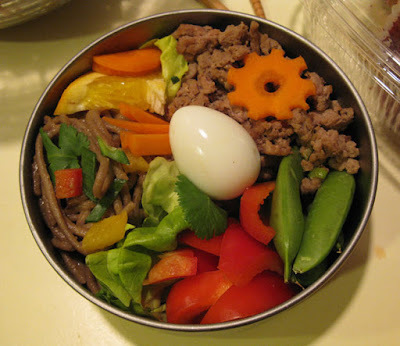 I have made bento box lunches with my daughter, and she loved it. 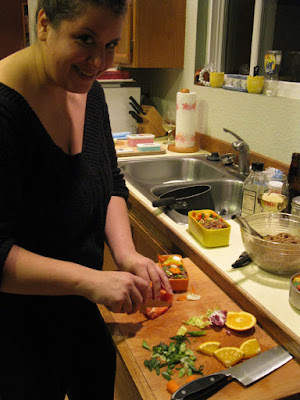 During my recent trip to Seattle, I decided to try making bentos with my sister and my mom. It's Mother Daughter Bentos! My sister Sarah and I headed to Southcenter Mall to find a cool bento box for her, and to get ingredients at Seafood City. We tried a place called Tokyo Lifestyle, but their selection of bento boxes was not great. The one she got was at Borders, made by Paperchase. It's four separate boxes for 10 bucks, such a deal, and they are really cute, with images of little smiling fruits, veggies, and other food on them. 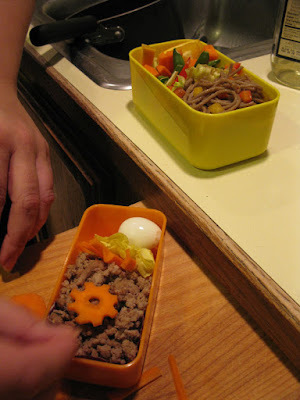 My sister works on her two tiered bento here. We had soba noodles tossed with a homemade sauce, ground turkey soboro, hard boiled quail eggs, carrots, sugar snap peas, oranges, scallions, lettuce, and red pepper. Sarah is choppin red peppers! We also bought some edamame, but used the sugar snap peas instead. They worked really well. 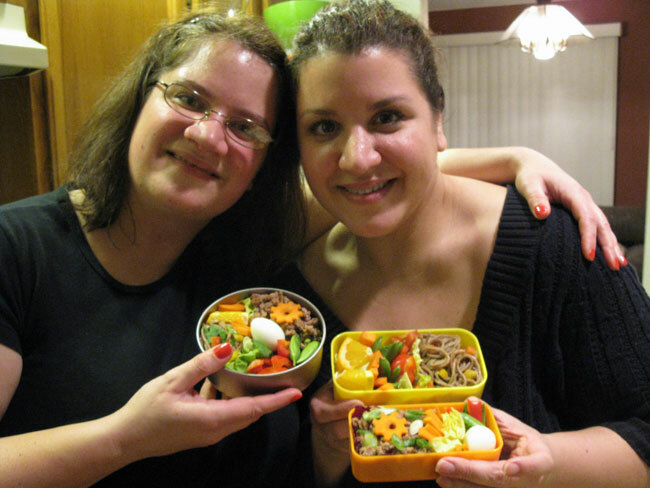 Me and my sister with our bentos! We made enough food for dinner for the three of us, and stowed the filled bento boxes away for lunch the next day. Me and my mom (who finished her treatment for breast cancer and looks great!) with our completed bentos. I had given mom this bento box a while ago, but this was the first time she used it. Here's a closer look at mom's bento. Very nice arrangement! We had to smoosh the ingredients down a bit, but she had a bento box strap to hold the tiers together. My bento box, which is actually just a food storage container I got at Daiso. But it's so easy to use and has a great tight fitting lid, so it doesn't spill. I used this as my in flight bento on my flight back to Sonoma County. 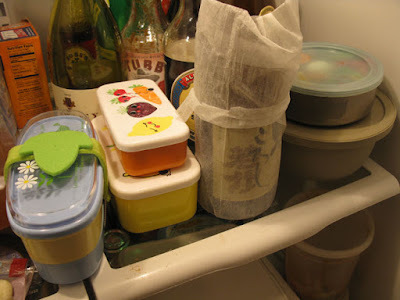 All of our bento box lunches tucked safely away in the fridge. I know it is not 'oishii' to make bentos the day before, but I was leaving too early in the morning for us all to do this together. Of course, the main reason I was in Seattle was to visit my brand new niece, Molly Ruby. She's the first baby born to any of the siblings in our family, so it's a pretty big deal. Here's a video montage of some pics from my visit with Molly. I can't wait to make her some baby bentos! Aww! Congrats on the cute lil baby you get to cuddle! And on the bentofication of your family. Nice! Thanks so much, Susan! 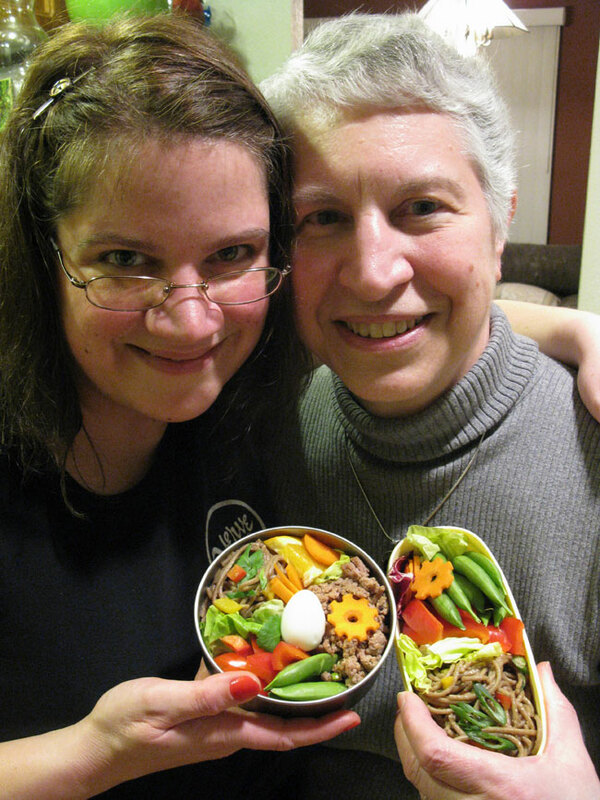 It was so fun to make bento lunches with my mom and sis. 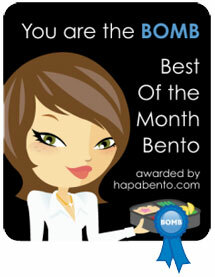 I think those are your best bentos yet! Guess it helps having more than one person to make and eat them. Great collage video, too. How did you do that? Thanks so much dragonmamma! 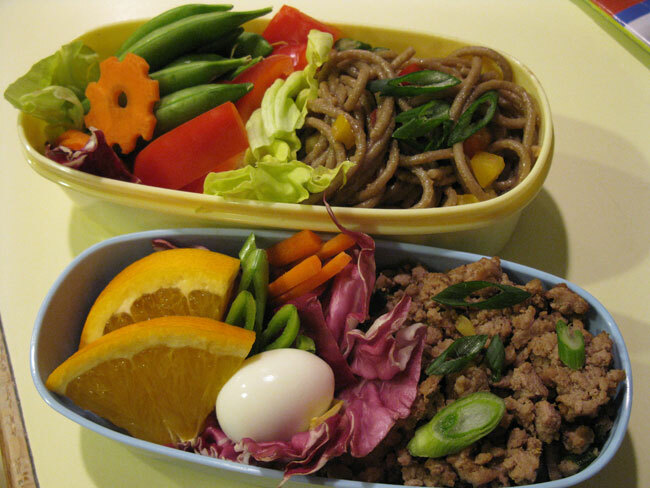 It was easy to make all three bentos at once, even though each ended up looking a bit different. The video is made with a free service called Animoto. You can use it for free if you are only doing 30 second videos, but you can subscribe to the service and make longer vids. Super easy to use the interface, just by uploading pictures. 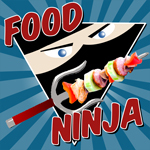 Check it out at animoto.com.